XLsoft Corporation is a leading software distribution and localization firm of developers' software products for the Japanese and Asian market. 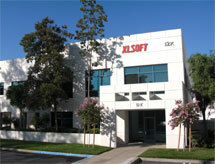 Founded in 1987, XLsoft is headquartered in Irvine, California, and prides itself in being a brand name in the International software industry. Distributing only the most innovative products to software developers, XLsoft has re-published and localized award-winning software, which include Intel C++/Fortran Compiler and VTune Analyzer, PKWARE PKZIP and SecureZIP, Jungo WinDriver, activePDF, SpreadsheetGear, Source Insight and many other extraordinary software products for the international market. Focusing on distributing Development Tools and Utilities, XLsoft has established many strong relationships within the computing industry for over a decade. XLsoft is well trusted in introducing groundbreaking products to the Japanese market; hence their clients include industry-leading pioneers such as Intel, IBM and NEC Japan. XLsoft has achieved success in presenting the latest American software trends to the Japanese market as well as hosting intercontinental trends in the United States. With a strong Localization/Service team in Irvine and dedicated Sales and Marketing teams in Tokyo, XLsoft continues to grow as a key player in the international software industry. For more information regarding XLsoft Corporation, please feel free to make contact through the addresses above.